For the governorate from 1917–18, see Autonomous Governorate of Estonia. 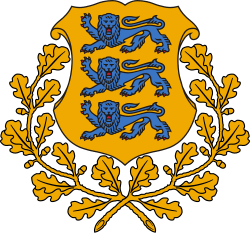 The Governorate of Est(h)onia (Estonian: Eestimaa kubermang) or Duchy of Estonia, also known as the Government of Estonia, was a governorate of the Russian Empire in what is now northern Estonia. The Governorate was gained by the Russian Empire from Sweden during the Great Northern War in 1721. The Russian Tsars held the title Duke of Estonia (Russian: Князь Эстляндский, Knyaz' Estlyandskii), during the Russian era in English sometimes also referred to as Prince of Estonia. Until the late 19th century the governorate was administered independently by the local Baltic German nobility through a feudal Regional Council (German: Landtag). Initially named the Reval Governorate after the city of Reval, today known as Tallinn, it was created in 1719 out of territories conquered from Sweden in the Great Northern War. The former dominion of Swedish Estonia was formally ceded to Russia in the Treaty of Nystad in 1721. 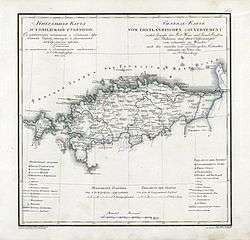 During subsequent administrative reordering, the governorate was renamed in 1796 into the Governorate of Estonia. While the rule of the Swedish kings had been fairly liberal with greater autonomy granted for the peasantry, the regime was tightened under the Russian tsars and serfdom was not abolished until 1819. The governorate consisted the northern part of the present-day Estonia approximately corresponding to Harjumaa including the city of Tallinn, Western Virumaa, Eastern Virumaa, Raplamaa, Järvamaa, Läänemaa and Hiiumaa. After the Russian February Revolution on 12 April [O.S. 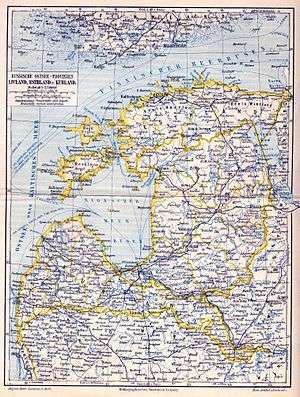 30 March] 1917) it was expanded to include northern Livonia, thereby forming the Autonomous Governorate of Estonia. Tallinn remained under Soviet control until 24 February 1918, when German troops occupied Estonia and Estonian independence was declared. The governorate was subdivided into four Kreises (uyezds). According to the Imperial census of 1897. In bold are languages spoken by more people than the state language. ↑ Juan Pan-Montojo; Frederik Pedersen, eds. (2007). Communities in European History: Representations, Jurisdictions, Conflicts. Edizioni Plus. p. 227. ISBN 9788884924629. ↑ Bojtár, Endre (1999). Foreword to the Past. Central European University Press. ISBN 978-963-9116-42-9. ↑ Ferro, Marc; Brian Pearce (1995). Nicholas II. Oxford University Press US. ISBN 978-0-19-509382-7. ↑ Smith, David James (2005). The Baltic States and Their Region. Rodopi. ISBN 978-90-420-1666-8. ↑ Эстляндская губерния (in Russian). Руниверс. Retrieved 22 December 2013.